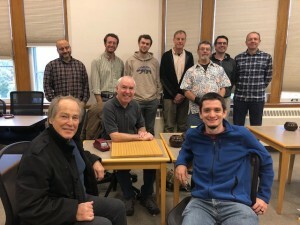 Ten players participated in the Vermont Go Championship on Saturday, October 27th. Dave Felcan 2d (standing at far left) went undefeated with three wins to take first place. Second place went to Jack Homer 1k with a record of 2-1. Rich Chalmers 1d claimed third place, also with a 2-1 record. “It was a very fun and exciting day with lots of great games and tough matches,” reports organizer Pete Schumer. All players received prizes including trophies, books, magazines, go playing cards, and DVDs. “We look forward to hearing from our fellow states!” Pete tells us.